Use the Regency 42 wall mounted tubular rack shelf to sort your beverageware. When youre organizing your glassware into separate glass racks, the Regency 42 wall mounted tubular rack shelf can help you get organized. Since this shelf mounts directly to your wall, you can load up your rack without using all of your counter space. Made to hold two glass racks at a time, this product will allow you to make quick work of sorting your tableware for washing and storage. For the ultimate in durability, this rack is made with 1 5/8 diameter 18 gauge stainless steel tubing and 16 gauge type 430 series stainless steel side brackets. 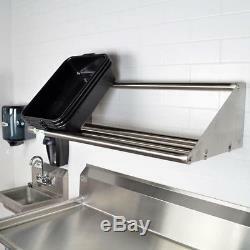 Depending on the setup of your dish room, you can use this shelf to hold your dish rack flat or at an angle. This makes for easy loading, no matter where you have the shelf installed. For your convenience, this product comes with stainless steel mounting bolts. This NSF Listed shelf ensures no stray crumbs or spilled liquids get stuck in hard-to-reach places. The item "Regency 42 Wall Mounted Tubular Rack Shelf Commercial Free Shipping USA Only" is in sale since Wednesday, December 6, 2017. This item is in the category "Home & Garden\Kitchen, Dining & Bar\Kitchen Storage & Organization\Racks & Holders". The seller is "bobd0588" and is located in Louisville, Kentucky. This item can be shipped to United States, Canada, United Kingdom, Denmark, Romania, Slovakia, Bulgaria, Czech republic, Finland, Hungary, Latvia, Lithuania, Malta, Estonia, Australia, Greece, Portugal, Cyprus, Slovenia, Japan, China, Sweden, South Korea, Indonesia, Taiwan, South africa, Thailand, Belgium, France, Hong Kong, Ireland, Netherlands, Poland, Spain, Italy, Germany, Austria, Israel, Mexico, New Zealand, Philippines, Singapore, Switzerland, Norway, Saudi arabia, Ukraine, United arab emirates, Qatar, Kuwait, Bahrain, Croatia, Malaysia, Brazil, Chile, Colombia, Costa rica, Dominican republic, Panama, Trinidad and tobago, Guatemala, El salvador, Honduras, Jamaica, Antigua and barbuda, Aruba, Belize, Dominica, Grenada, Saint kitts and nevis, Saint lucia, Montserrat, Turks and caicos islands, Barbados, Bangladesh, Bermuda, Brunei darussalam, Bolivia, Ecuador, Egypt, French guiana, Guernsey, Gibraltar, Guadeloupe, Iceland, Jersey, Jordan, Cambodia, Cayman islands, Liechtenstein, Sri lanka, Luxembourg, Monaco, Macao, Martinique, Maldives, Nicaragua, Oman, Peru, Pakistan, Paraguay, Reunion.